Before heading into one of our participating pharmacies, use our convenient pricing tool to get estimated prices for the medications you need today. Simply enter your zip code and the drug name to see the discounted price the United Consumer Benefits Rx Card can provide at pharmacies near you. 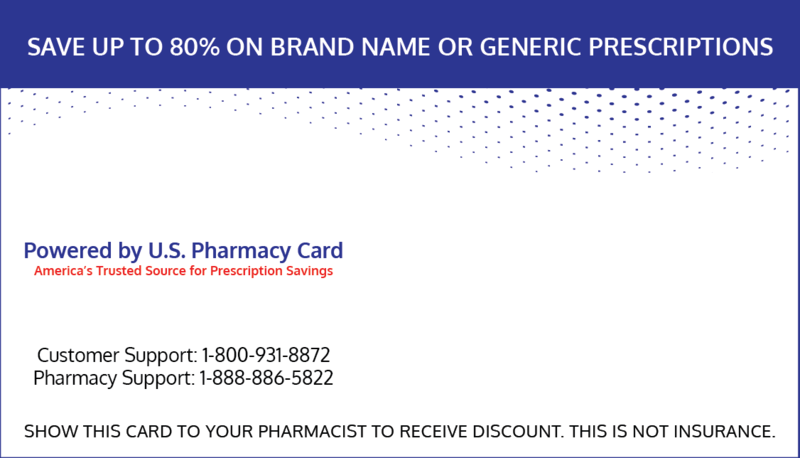 This discount prescription coupon card will provide you with Rx medication savings of up to 80% at thousands of pharmacies across the country including CVS, Walmart, Kroger, Walgreens and their affiliates. You can create as many cards as you need. We encourage you to create multiple cards and send to friends and family members via one of the many available options. The Card is pre-activated and can be used immediately! Select a social network to share this card with family and friends. Use the form below to email this card to family and friends. Click the button below to print this card to take to your pharmacy. Does the discount prescription card program collect or use personal data? No. We do not require, sell or share/re-market your personal data. Is there a cost to use the card? No. The card is absolutely free to use!! Does everyone qualify to use the card? Yes. Anyone can use the card, there are no restrictions or pre-qualifications. The card can be used by Individuals and family members regardless of a person’s health, age, immigration status, or income, and there are no limits on how many times it can be used. What prescription drugs medications are discounted with the card? There are over 60,000 prescriptions medications discounted, both brand name and generic medications. The Card also covers some pet medications! Check to see if your specific medication is discounted using our Prescription Drug Pricing Tool. Do I have to register the card before using it? No. This prescription discount card does not require registration or any pre-qualifications. 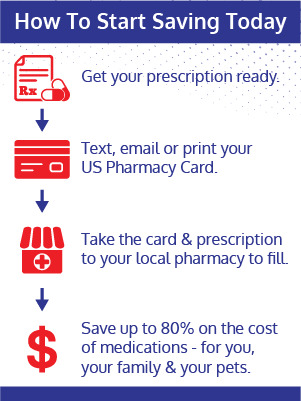 Simply print, text or email a card to yourself and provide the card to your pharmacist at checkout for instant savings. How many pharmacies are in the discount prescription card network? There are thousands of pharmacies in the network. The discount card can be used at all major pharmacy chains, and many independent pharmacies in all 50 states and all U.S. territories, including Puerto Rico, Guam, and U.S. Virgin Islands. You can save up to 80% on an individual prescription. Savings may be greater or less than 80%, Check to see how much you can save today by entering your prescription into our RX Savings calculator. No. There is no expiration date and no limit on usage. Does a cardholder need more than one card for his or her family? Can I use my health insurance card at the same time as the discount prescription card? No. Two cards may not be used at the same time – so unfortunately, you can’t combine both insurance savings and card savings. However, if a prescription drug is not covered by your insurance, use the Card to receive your discount. Note: If your prescription is covered by insurance, compare the price with insurance applied to the price with the card discount – and choose whichever price is cheaper! Are some medications covered under the card that other prescription plans do not cover? Yes, occasionally. If a health insurance prescription plan does not cover a certain prescription medication, the card may provide a discount. The card can also be used to fill pet prescriptions, as long as the prescription can be filled at a pharmacy. What if the cardholder is a Medicare Part D participant? Medicare Part D participants are usually 65 years old or older. There is a gap in participant coverage that is called the “donut hole” where Medicare participants must pay out-of-pocket up to a certain amount. The Card provides an option to help participants in the “donut hole” get relief from high prescription drug prices. Is the discount card considered insurance? No. The card is not insurance and it is not intended to replace insurance. Great for those who are uninsured or underinsured or if you are in the Medicare "Donut Hole"